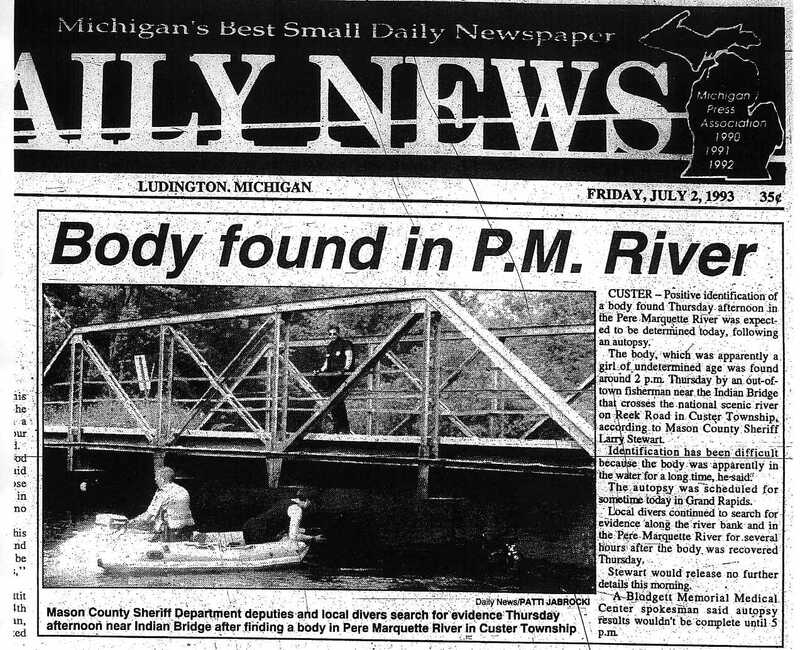 SCOTTVILLE — In the early afternoon of July 1, 1993, a man fishing from a canoe spotted a partially-clad, partly decomposed body floating in the Pere Marquette River just west of Custer Township’s Indian Bridge in Mason County, Mich. Dental records would confirm that it was the body of Melissa “Missy” Marie Simmons, a teenager who had left her family’s Scottville home eight days earlier — never to return. Melissa, 15, was last reported being seen alive that night, June 23, 1993, around 10 p.m. She was with some friends at a Scottville Wesco station, as reported by the Ludington Daily News. Melissa’s stepmother, Rosemary Simmons, said the family was frantic to find “Missy” at the time. “I took a week off work and put up flyers hoping someone would know something,” she said. 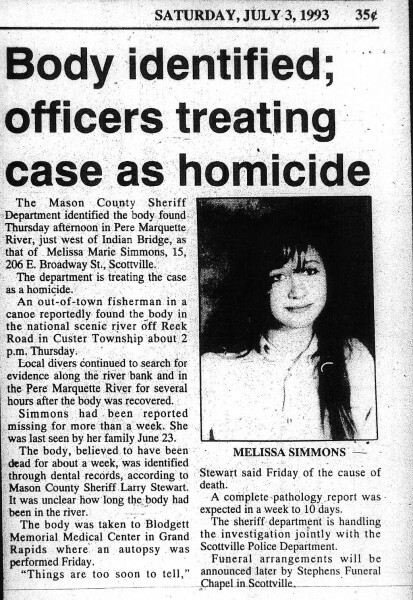 Forensic reports on Melissa’s body later showed that she likely died the night she disappeared, or shortly thereafter. Details regarding her cause of death or what was contained in the autopsy, including a toxicology report, have never been disclosed by the Mason County sheriff’s office. There were rumors of a large party at Whelan Lake on the night Melissa disappeared, a little more than a mile from where her body was found. 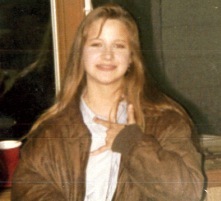 But the party — and whether or not Melissa had been there — also has never been confirmed. 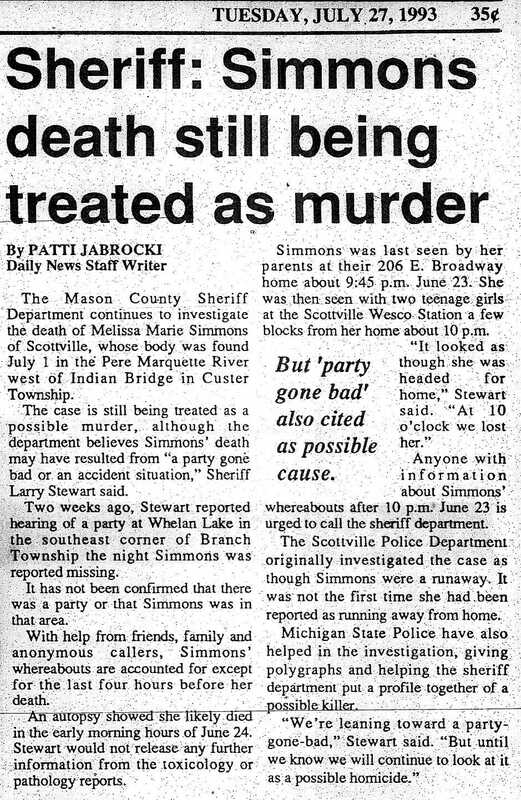 Numerous suspects have been investigated since 1993, according to current Mason County Sheriff Jeff Fiers, but no arrests have ever been made in the case. He said that leads are still being pursued, and making details public could jeopardize the case. 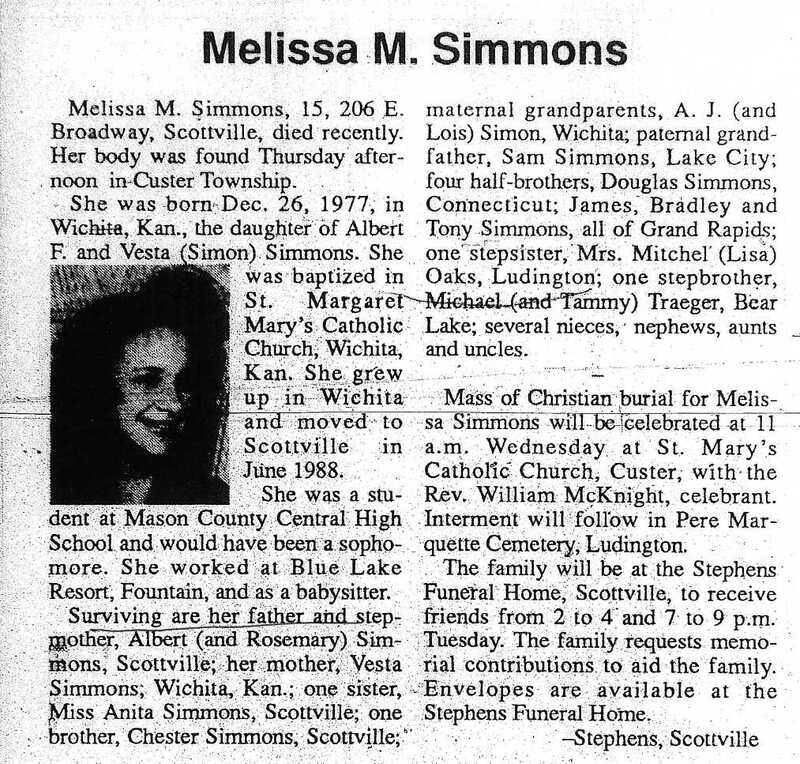 Melissa was born in Wichita, Kan., and moved to Scottville with her father, stepmother, brother (Chester), sister (Anita) and stepsister (Lisa) in 1988. 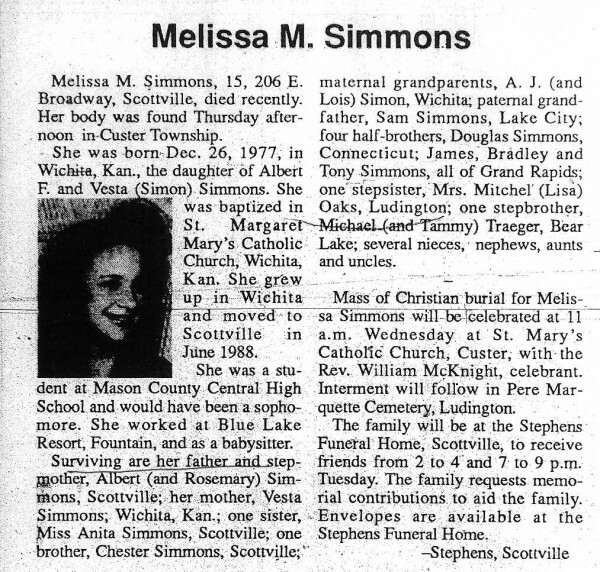 Her birth mother, Vesta Simmons, was still living in Wichita at the time of Melissa’s death. 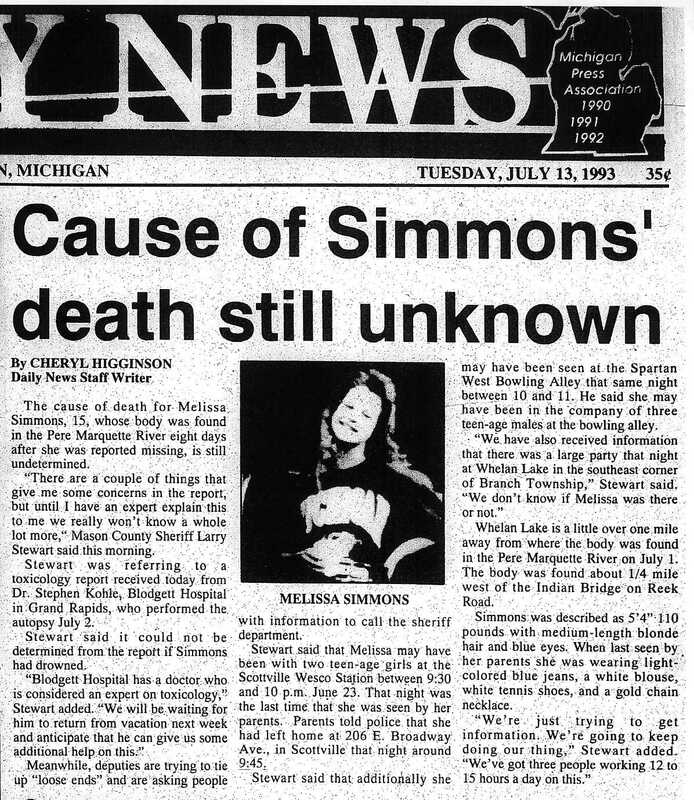 During the summer she died, Melissa had a job at the Blue Lake Resort in Fountain, MI, and was going into her sophomore year at Mason County Central High School. 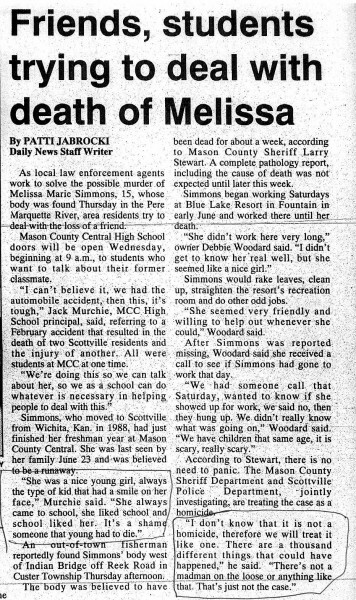 Nineteen years later, Melissa’s family still wants to know what happened. She added that she didn’t believe Melissa would have committed suicide. “That just wasn’t Missy. She was a happy girl,” she said. Det. Sgt. Tom Posma, supervisor of the Mason County Detective Bureau, says he’d welcome any new leads and information that would shed light on what happened to Melissa Simmons on that summer night in 1993. “We’d appreciate any tips or evidence that could be brought forward at any time,” he said, adding that informants should call 231.843.3475 and ask for any detective. Here are contemporary newspaper accounts. Please click on the image to enlarge it. 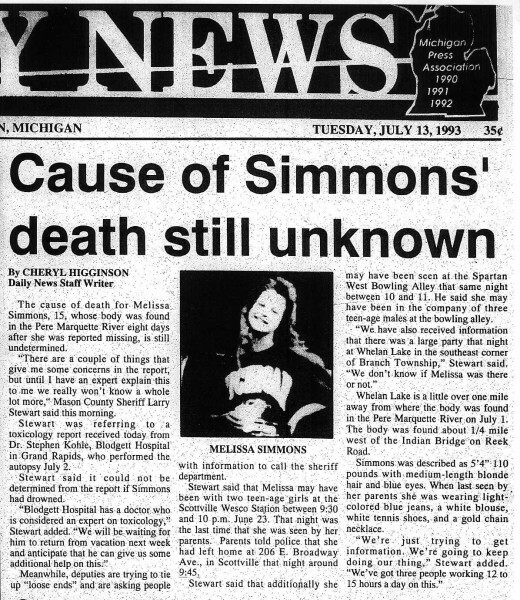 June 30, 2012, Luddington Daily News: "Melissa Simmons case unsolved after 19 years"
Posted on Thursday, March 22nd, 2012 at 11:30 pm. Last updated on Tuesday, July 3rd, 2012 at 4:53 pm.